Tecan engineers and scientists are committed to delivering the highest standards of quality by focusing on the details that your data is true and consistent empowering your discovery. Which instrument for which application? - Click here! 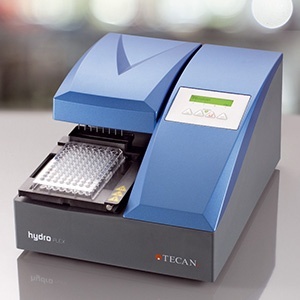 The new HydroFlex 3-in-1 microplate washer for ELISA assays, magnetic beads and cells in 96-well plate format combines application flexibility & performance in a compact design. 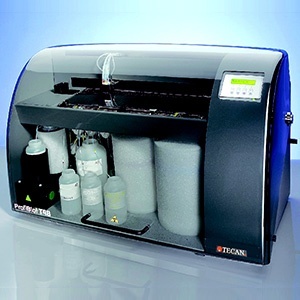 The new expert plate washer for cells, beads and ELISA assays in 96- and 384-well plate formats. Benefit from speed & full control of wash power for optimized results. 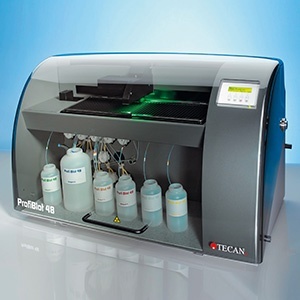 The ProfiBlot 48 is an automated blot processor used in clinical diagnostics for the confirmation of infectious and autoimmune diseases as well as the screening of allergies. 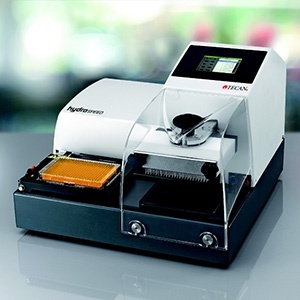 The ProfiBlot T48 is a fast temperature controlled Southern Blot Processor & Western Blot Processor for automated reagent dispensing, hybridization and washing of a range of strip-based assays.